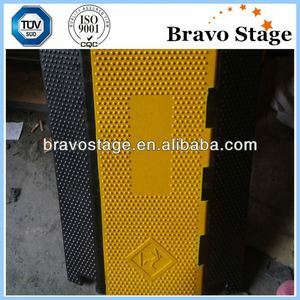 7 YRS Guangzhou Bravo Stage Equipment Co., Ltd. 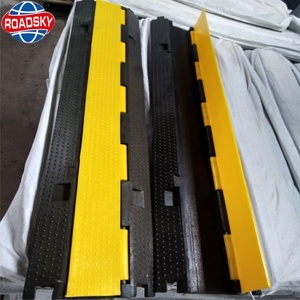 Parking lot entrance speed bumps and cable protection cover Specification of this Cable Ramp: * Lightweight and easy to set up,disassemble,trnasport and store. * Carrying handle is conveniently recessed on underside of protector. net weight :11KG 2. 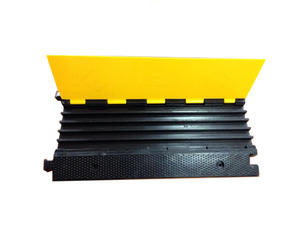 3 channel &middot; Outshape size: 1000x310x55mm; channel size: 35x35mm &middot; Net Weight: 14.5KG/ pcs 3. 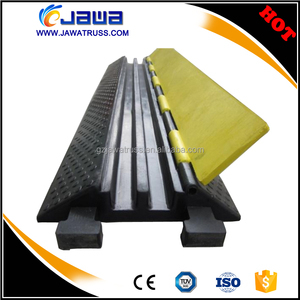 5 channel &middot; Outshape size: 770x485x65mm; middle channel size: 42x18mm &middot; Net Weight: 19KG/ pcs 4. color : red and yellow for choosing. After drilling clean up the holes and romove the dust,oil and debris from the holes . using the special adhesive,put the bottom of the bump to the surface of the road. 5Fixer for asphalt roads,expensive screw purchase on the local markets. 1. Features 1.1 Cable protectors are made of high strength rubber, so they have highly capacity of resistance pressure. 1.2 Cable Protectors can play a role in reducing the damage to the tire because of their soft slope. 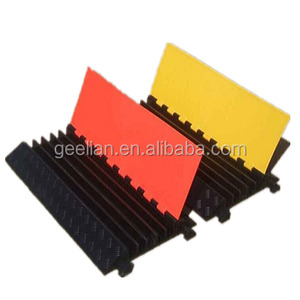 1.3 Special process can ensure that colors of cable protectors are bright, not easy to fade. They can be joined together to meet your different requirement in length. 3.Good delivery time and find for best freight for client's reference. Q: Can your produce customized goods 9 A: Yes, we can be produced depend on per client's requirements. Controls the speed of traffic and at the same time covers heavy duty cables or cable looms. 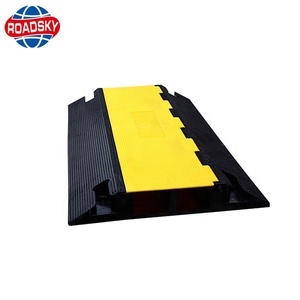 Manufactured from recycled rubber and designed to protect cables from vehicles of all types. 10,Did your products apply the patent9 Yes,we have rubber anti-fatigue mat & rubber cable protector patent. We are committed to create the greatest value for clients all over the world by providing the most competitive flight cases solutions and services. We endeavor to provide customer products with high quality, modern designed and competitive price. We believe that quality products, good services, advance technology can keep customers to achieve good profit ! 5.We try best to reach competitive price on the condition of the same quality. 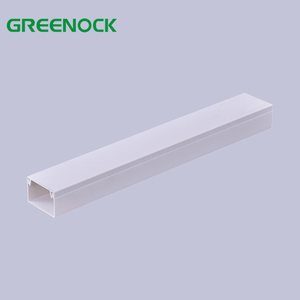 As we are in this industry for more than 8 years, so we know customer requirements well, and products function are stable. Before the cargo going out of our facotry, we will make a last inspection. 4 YRS Zhejiang Bestsea Technology Co., Ltd.
What is our payment9 : Q: Can your produce customized goods 9 A: Yes, the size, the height and the weight can be produced as per client's requirements. Q: Can you print words on products as per client's requirement9 A: Yes, make label according to your exact requirement. Q: What is your payment terms9 A: T/T, L/C at sight or Paypal. Perfect solution for temporary events such as fairs, conventions, and trade shows; Safety warning symbols molded into lid surface, with universal safety colors for high visibility; Lightweight and easy to transport, setup, disassemble and store. Carrying handle is conveniently recessed on underside of protector. Safety warning symbols molded into lid surface. 7 YRS Shenzhen Events Technology Co., Ltd. 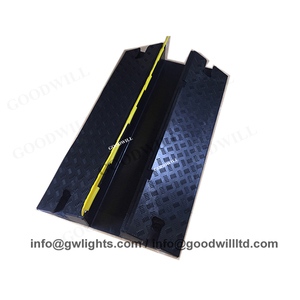 If you are intersted in the new kind of product,pls contact us for more details. Any questions,do not hesitate to contact us for more info abou the cable protector. Now we have sales promotion before Chrismas Day,for more information,pls kindly contact us. 13 YRS Zhejiang Sanmen Hongqiao Rubber & Plastic Technology Co., Ltd.
Alibaba.com offers 3,105 cable protection cover products. About 15% of these are speed bump, 1% are mobile phone bags & cases, and 1% are guard shield. A wide variety of cable protection cover options are available to you, such as free samples, paid samples. 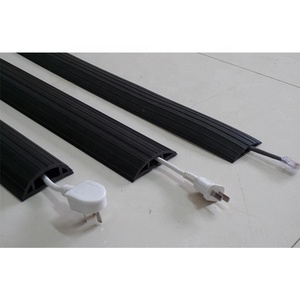 There are 3,105 cable protection cover suppliers, mainly located in Asia. The top supplying country is China (Mainland), which supply 100% of cable protection cover respectively. 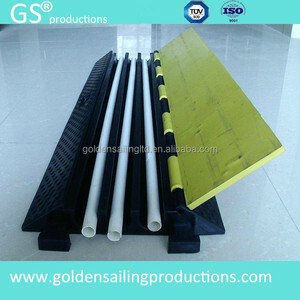 Cable protection cover products are most popular in North America, Domestic Market, and Western Europe. You can ensure product safety by selecting from certified suppliers, including 1,627 with ISO9001, 606 with Other, and 171 with ISO14001 certification.